Has BMW’s M division completely lost its collective sanity? Once the purveyor of some of the world’s most lithe, tactile, naturally aspirated sports machines, they’ve gone and made this: a near three-ton, twin-turbo SUV. In the ‘80s and ‘90s, this would be borderline unforgiveable. So what gives? Well, despite a shrinking global economy and uncertain automotive industry, the super-ute market remains an untapped resource for BMW. And, surprisingly, these super-fast behemoths are still selling. Even given the highly capable competition (we’re looking at you, Porsche Cayenne Turbo S), the X5 M remains highly impressive, able to sprint from 0-60 in under five seconds courtesy of its sledgehammer 555 horsepower twin-turbo V-8 engine. And it’s pretty capable in the bends too, with its four-wheel drive system and massive 20-inch wheels offering tons of grip. Compared to the X6 M, it’s incredibly practical as well, even though practicality was never really the idea behind this car. For a giant, cumbersome SUV, the X5 M manages to feel surprisingly agile, and the ample turbo torque means massive acceleration is available whenever you please. It’s a fantastic tourer, with very comfortable seats and a supple ride when you want it, thanks to the variable suspension system. Fuel economy is inexcusably dismal and you’ll be lucky to see mid-to-high teens, even if you drive almost exclusively on the highway. It might have a V-8 and boast well over 500 hp, but where is the accompanying soundtrack? 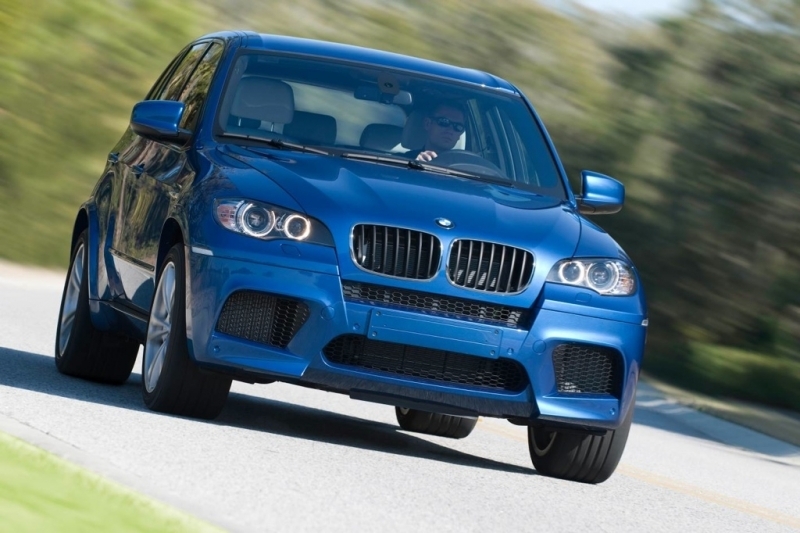 Unlike BMW’s 4.8-liter, the engine in the X5 M has no deep rumble to it whatsoever. The X5 M is all about mid-range turbo grunt, delivering a heavy thud of torque from just above idle that doesn’t let up until 6,000 rpm. It’s a fantastically flexible engine, feeling every bit as manic at 3,000 rpm as it does at redline, even if the V-8 is wanting for better vocals. The automatic transmission shifts incredibly fast but sacrifices none of the buttery-smooth off-the-line characteristics that some dual clutches have trouble replicating. Get it into a corner and the balance and grip are surprising to say the least, but feel through the steering wheel is frighteningly vague for a BMW. Still, the X5 M feels like it has all the ability of the much less practical X6 M, but in this package we like it a whole lot more. The X5 M is powered by a 4.4-liter twin-turbo four cam V-8 engine that produces 555 horsepower and 500 lb-ft of torque at as low as 1,500 rpm. Power is driven to all four wheels via a six-speed automatic gearbox with steering wheel-mounted paddle shifters. There aren’t a lot of options available, but one cool add-on is the Driver Assistance Package, which adds a heads-up display, automatic headlights and rearview camera with a very cool top-down view that makes parking feel like a video game. Inside, the X5 is quite roomy and has a refreshing amount of space when compared with the claustrophobic X6 M. iDrive has significantly simplified the console layout and the carbon fiber on the dash and console perfectly fit the car’s brute force, high-tech attitude. Lower side skirts, blistering wheel arches and gaping front-end air vents give the X5 M the presence of a bare-knuckle boxer in a room full of accountants. All of the new panels and low ride height hide the car’s tall-ish stature, like a hatchback that’s had everything turned up to 11. 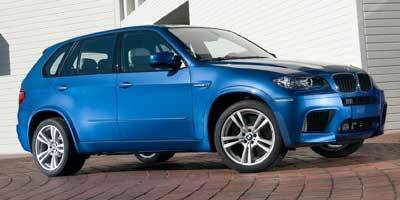 The 2010 BMW X5 M comes in at an MSRP of $85,400, but keep in mind that the price of entry into the super-ute club is quite high, as is evidenced by its competitors. 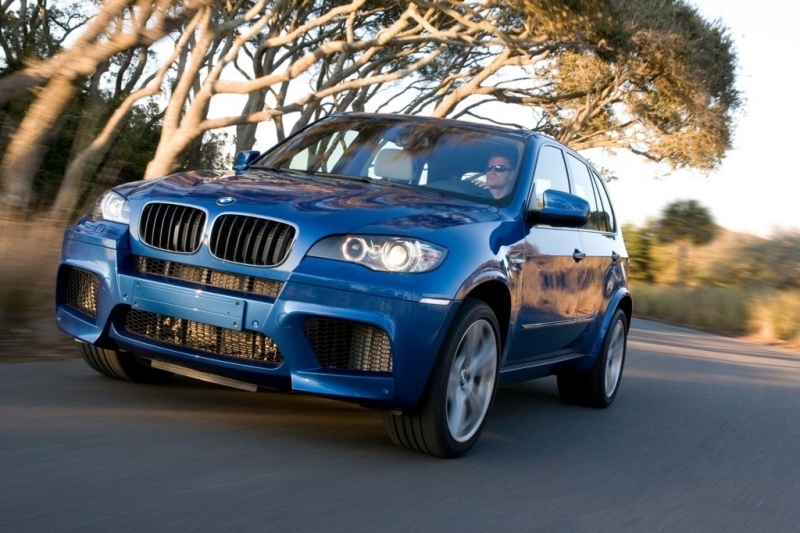 These include the Porsche Cayenne Turbo ($99,900), Mercedes-Benz ML63 AMG ($91,050) and, of course, the BMW X6 M ($88,900). The X5 M may eat more fuel than a medium-sized helicopter and cost as much as a Porsche 911, but it’s a damn sight more practical that the X6 M with which it shares its drivetrain. We didn’t think anything would come along that could genuinely rival the Porsche Cayenne Turbo, but the X5 M is a serious contender for the super-ute crown.